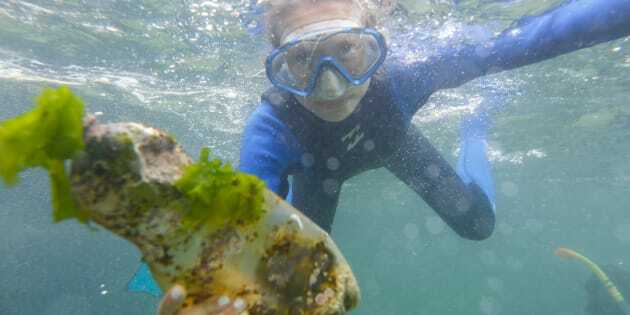 A South African snorkler picks up a plastic bottle from the sea bed of the Indian Ocean off Millers Point in Cape Town, South Africa on July 29 2018. The team, which is led by Quebec native Sarah-Jeanne Royer, has garnered international attention ever since their findings were published in the American scientific journal PLOS ONE last week. Royer said the researchers found that some types of common plastics emit greenhouse gases when they degrade, and that the phenomenon is intensified by sun exposure. Plastic bags, bottles and cups float in the ocean near the Phi Phi Islands in Krabi, Thailand. "Aided by solar radiation, the plastic will degrade and become microplastic, and the more the plastic breaks down into smaller pieces, the more it will produce greenhouse gases," the oceanographer told The Canadian Press in a phone interview. "If we look at the last 70 years, all the plastic that has been produced is currently being degraded in the environment and producing greenhouse gases. So the longer we wait, the more (greenhouse gases) will increase exponentially." So-called 'Ecobricks' - usually an old plastic bottle filled solid with non-biological waste - are displayed as part of an educational exhibit encouraging the production of ecobricks in households in the 'Two Oceans Aquarium' in Cape Town, South Africa, on July 22 2018. People sort through plastic bottles they collected and are about to sell at a junk shop in Manila on March 10, 2015. The Philippines placed third among the list of countries with the most ocean plastic pollution per year. "In Asia, they no longer have places to put waste and an incredibly high number of garbage will end up along the coast," she said. "Afterward, the high tide arrives and brings all this waste to the ocean." Some 800 shopping bags made of plastic sewn together in the shape of a fish are laid out by environmental activist group Greenpeace, in a protest against the pollution of oceans by plastic, in a street in Vienna on Jan. 29, 2015. It's unclear whether the results of the American study will interest Donald Trump's administration, who left June's G7 summit meeting in Quebec without signing an agreement to reduce plastic waste in oceans, as did Japan. It also doesn't appear to interest members of the plastic industry, who Royer says have thus far refused to co-operate with her team. A view of an art installation made of about 40,000 waste plastic bottles collected from the beach during the construction of an ocean park in Rizhao in east China's Shandong province Saturday July 21, 2018. The installation is 9.1 meter long and 5.6 meter wide. "It was extremely difficult to communicate with them, and eventually they all told me they didn't want to answer my questions or communicate with me," she said, adding that she doubts her research comes as a surprise to the industry's big players. "In my opinion, the plastic industries know (the effects of plastic) very well and don't want to share it." For the last three years, she's been collaborating with NGOs such as Greenpeace and the Leonardo DiCaprio Foundation in order to keep the public informed on the latest research into ocean pollution. CORRECTION: Aug. 6, 2018: An earlier version of this story misidentified the name of the journal that published the study about plastics and greenhouse gases as Plot One. The correct name is PLOS ONE.